Psychic baiting is a great new fun way to pass your leisure hours. My hope is that it will become a popular new pastime all over the world. In essence, psychic baiting is the only sure way to demonstrate that someone giving readings is using cold reading, not genuine psychic ability. It involves going for a reading and allowing the psychic - which I stress means 'cold reader' in this case - to get snared by her own methods. Warning: It is obviously inadvisable to try psychic baiting if you feel that this would place you in jeopardy or that you might get harmed. Some cold readers might be less than peaceful if they feel you are interfering with their trade. You undertake any activity along these lines entirely at your own risk, and I cannot be held responsible for the consequences. If you feel there is any chance of confrontation or harm, don't do it! So how does it work? All that you have to do, as the client, is to wait until the psychic offers you some verifiable piece of information which, as it happens, is not true. You then tell a fib by agreeing to it, even though it is false. Next, you encourage the psychic to develop this thread, until some minutes later you spring the trap. "There are indications here of a new professional role, does this mean something to you?" Now, for the sake of the example, let us assume that this is completely false, and it means nothing to you at all. Here is how the baiting works. "That's quite amazing actually, because two weeks ago I got a newjob at the same company where my husband works. We were both really pleased." "I was hoping you might pick up on that because it's very important to us both. I'm glad I got the job, but it is quite a difficult challenge for me." "Well, one thing I can see is that both you and your husband are in for a difficult time of transition, but it will be well worth it in the end. I can see plenty of happiness in your new role, and I can also see that it will open up many new horizons for you. The key is to see the challenges as opportunities, which is what they are." "I have to say that does sound right, it certainly fits in with my expectations. What else can you see in the cards about this new job?" "I see some minor problems with one of your new colleagues, or with your new boss, but these will be ironed out smoothly in time. Also, while your new role will be satisfying financially, I can tell you that you will also encounter new areas of expenditure. All will come good in the end, but you must learn to take the long-term view. In fact, there are some financial opportunities just around the corner that will help, provided you assess them wisely." "It's amazing. 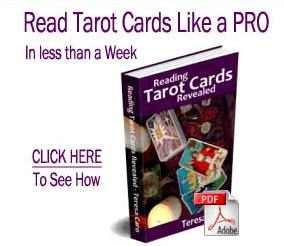 I had no idea the tarot could really be so accurate". "Well, it's never easy to be clear or certain, but the cards are often a wonderful window on to truth." "Well, I'm confess I am rather puzzled about one thing. I don't have a husband, and I haven't started a new job. How can you see things about a husband and a job which I just made up?" "That:'s right. I lied. But that doesn't explain how you 'saw' my husband in the cards when I don't even have one." It should be clear from this example that baiting can only work once the psychic has mentioned something factual. It cannot be based on a statement which concerns the future, or which is merely hypothetical or conditional in nature. You must wait until something specific comes along which you know is not true. "I'm sensing a presence of someone who passed about two years ago, and possibly the problem was in the heart or chest area. It s an elderly gentleman, who at one time had a beard. Does the name Harry or Henry mean something to you?" Let us assume that this means nothing to you at all. "Oh my goodness, really? It must be my grandfather, Henry. He passed over just before his wife, Emily." "Do you know, on my way here I had a funny feeling he'd come through." "Yes, that often happens. Well, he's here now, and he wants me to tell you how proud he is of you, but he's concerned that you're working too hard." "Oh, that's just exactly the sort of thing he would say. Its amazing that you can get messages through from the other side so clearly." "Well, don't thank me, I'm just a channel." "But it's so amazing. I mean, its almost as if he's here in the room with me." "Mind you, there is one thing that puzzles me a little bit. I've never had a grandfather called Henry, nor anyone in the family called Emily. So what's going on here? How can you be getting messages from people I have just made up off the top of my head?" 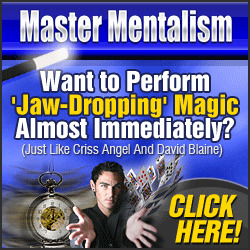 The same basic formula can be used to bait any kind of psychic. You just have to adjust the game slightly, depending on what kind of psychic brilliance is on offer. I repeat my earlier warning and disclaimer. I cannot be held responsible for whatever happens if you try these tactics. Some cold-readers are very hostile to anyone who can damage their thriving trade. You undertake any such activity at your own risk. Psychic-baiting is versatile. It is equally damaging to any form of cold reading. If the astrologer sees that you have had some romantic distress, look sad and own up to your recent commencement of (imaginary) divorce proceedings. Get the psychic to develop this theme further, before confessing that you have never been married, and are not having a divorce. If the graphologist detects some managerial flair, smugly own up to the fact that you run a large sales department for a major company. Glean all you can from the psychic about your wholly imaginary management role, and later on mention that you have never so much as stood in a sales department, let alone run one. And so on. Provided it can be undertaken safely, psychic baiting is great fun, and all the more so if you have the evidence on tape. What is more, if you do it right it ought to cost you nothing, since it should result in the 'psychic' terminating the reading, cancelling the fee, and wanting to see the back of you as soon as yesterday. In Section Four we have looked at ways of stopping cold reading from being used on you. We have also looked at 'Psychic Baiting', which is even more fun when you try it out than it looks on paper.